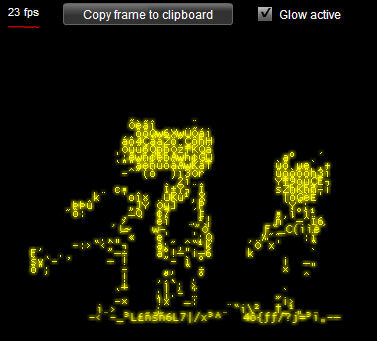 Browsing the archives for the ascii art category. There are trends on the web (as in real world) that last days or weeks and there are things that became a classic form of expression of the geek culture and are still interesting to explore after 20+ years. Ascii Art is one of these things. 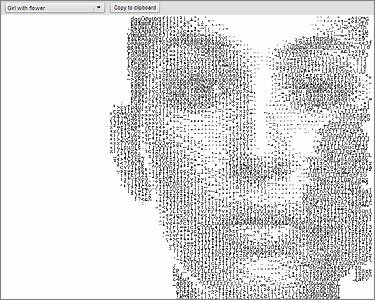 If you don’t know what ascii art is you’re probably reading the wrong blog, however for the one or two that doesn’t know about it, here you can learn more about it: Ascii art on wikipedia. I always had in mind the idea to create an actionscript class to render ascii art from pictures and now with as3 this is going to be possible at decent speed. My class is called Asciify and it can actually “ascii-fy” every DisplayObject instance on the display list. Usage is very simple and it’s actually REALLY fast. Didn’t think AVM2 could asciify a video in real time but I was wrong. You cannot go further certain resolutions but if you stay on small videos with decent detail 30fps are guaranteed. You can offcourse apply it to an animated movieclip or anything else. In this demos I use ProggyCleanTT font, but you can use any monospaced font that must be imported into the library and have a linkage (in this case I gave it “Font1″ linkage name). Then just play a little with size, leading and kerning of the textformat to achive the desired effect.